Thousand Pillar Temple or Rudreshwara Swamy Temple is situated in in the town of Hanamakonda, Telangana State, India.1000 Pillar Temple is a famous Hindu Temple dedicated to Lord Shiva, Vishnu and Surya Dev. 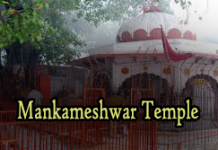 The temple is located between Warangal and Hanmakonda Chowrasta, close to main road. At a distance of 6 Kms from Warangal Railway Station (in Hanmakonda part of the city), Thousand Pillar Temple is one of the finest examples of Kakatiya architecture. 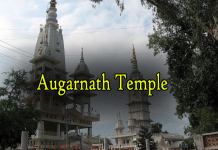 Rudra Deva built this temple in 1163 AD in the style of star shaped Chalukyan temples and named after him as Sri Rudreshwara Swamy Temple, it is dedicated to Lord Shiva. Separate shires for Lord Surya & Lord Vishnu in the temple are connected to main shrine by a square mandap in the centre. A beautifully carved giant Nandi (bull) is seen on the platform connecting the shrines. The exterior wall of the temple, the ceiling slabs and the four central pillars of the mandap are decorated with finely carved sculptures. Poojas are still performed. Visiting the Thousand Pillar Temple is a must if you want to learn more about the richness of our country. 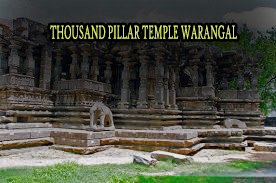 Thousand Pillar Temple is a very popular pilgrimage center, in Warangal and thousands of devotees of all faiths come here to pay their homage and get a glimpse of this wonderful construction. The temple has a star shaped architecture, which stands as a testimony to the expertise of the wonderful craftsmen of the glorious period. The amazing temple is supported by the pillars that are richly carved. You can find a huge monolith Nandi, made up of black basalt stone. The actual thousand pillar hall situated behind Nandi in the temple complex is currently being renovated by the archelogical department and closed for visitors.